So when your friend asks you "Hey do you want to come to the GoPro Mountain Games in Vail this weekend and stay in a friends condo? ", you have to say yes. The GoPro Mountain Games, previously the Teva Mountain Games, is one of the largest gatherings of elite adventure and mountain sport athletes in the country and consists of World Cup level events in kayaking, slacklining, fly fishing, rock climbing, cross country mountain biking, slope style mountain biking, hunting dogs big air jump, stand up paddleboarding, and 5ks and half marathons. I headed to Vail on Thursday and sat down to look into getting press pass. I got onto the press portion of the GPMG's website and saw that the registration was closed for passes. After a few phone calls and emails I finally got a hold of one and started shooting. Events like this are incredible for many reasons. First off they bring the world of adventure sports into an approachable arena for the public to see why we love these crazy things so much. It's so fun to see people walking around awestruck at someone landing a huge backflip in slopestyle mountainbiking or someone walking a highline over someone playboat kayaking. And then the people you meet out there are so cool. I met a ton of awesome people and photographers that weekend including this dude, Bill Bennet, who's just a rad, down to earth photographer from SC. Bill talking to the slopestyle athletes shortly after sneaking into the event. I don't want to bore you with my any more of my blabbing so instead of a long winded description of the GPMGs I'm going to share my top 10 images and the stories behind them. If it's one thing I'm terrible at, it's narrowing down my photos to a small selection. But these are the ones I really like in chronological order. Click any image to view full screen. This was the first thing I stumbled upon once I started walking around. This was just practice and there was hardly anyone around and these guys were still killing it! I’ve hung out with playboaters before but these guys were on a different level (judging by his RedBull helmet). I climbed down the rocks and caught this image of the playboater in the midst of a front flip. Yep, a front flip is possible in a kayak. I don’t know what you were doing as an early teenager but I definitely wasn’t doing stalls on a highline. After the trickline slackliners were done practicing they came over and put on a highline demonstration right on top of the playboaters that were still practicing. So epic! Slopestyle Mountainbiking. This was by far my favorite event to photograph. All the jumps were huge and these guys weren’t phased at all. This was the opening drop and most everyone 360’d it. The blurred out ramp in the foreground is the step up to another huge drop that leads into the really big stuff. There’s an image of a backflip off this a little farther down. 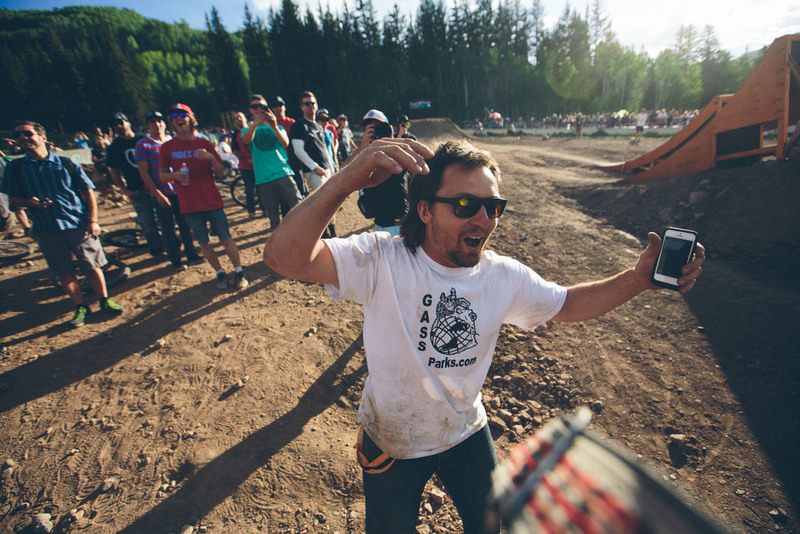 The GoPro Games were special for many reasons but the hype was one of the biggest. Everyone there watching really got into it and raised the energy level way up especially when the athletes asked them. This was during the tricklining competition in the middle of a head to head battle. Two competitors are given two minutes on the line each and switch when they fall. This guy was trying to get the crowd stoked just before his last attempt. Besides the bouldering world cup this was the largest crowd at any of the events which was so cool. It’s awesome to see people rally behind an up and coming event like tricklining. Meet Andy Lewis. He’s one of the more insane people I know of. This is called a squirrel backflip where you grab your heals in the middle of the flip. Of course he landed this one perfectly and the crowd went crazy. He’s a pretty inspiring guy that pushes the limits and always has a smile on his face. This also shows how big the crowd watching the tricklining was. Another reason the Games are so amazing: The athletes all support and cheer for each other. This was right after a one of the riders hit what’s called an ‘open loop’. Imagine a Hot Wheels-esk loop that’s human size and doesn’t have the top portion. It’s tough to say the least. I whipped around for this shot because the eruption that came from the other riders when he landed actually startled me a bit. So much support amongst this crew. I also wanted to share this image because this guy’s mullet is inspiring. This is definitely my favorite image from the entire weekend. The sun was setting and I was able to capture this guy in the middle of his backflip when the light was just perfectly illuminating his face. This is a testament to trying everything as a photographer, even if it sounds crazy. I was talking to the photographer next to me and said “I don’t want to stand under this drop but I wonder what will happen if I do this?” I just stuck the camera out and took a few shots as the rider flipped overhead. It was a long shot but I couldn’t believe the image I had just captured. For the Cross Country Mountainbike Race I my buddy, who was racing, for a good spot to set up and it turned out to be a bit of a hike. So I lugged my ~30lbs of camera equipment a few miles back into the woods and found some sweet steep turns. I had to get pretty close but all the riders seemed ok with it and the colors of the aspens and the sky were just too good to miss. This is my second favorite image from the weekend. I was at the same spot as the previous image but the aggressiveness of the rider compiled with the lighting and colors of the aspens and the sky really set this one apart. I’ve been climbing for a while and have always wanted to attend a bouldering world cup. It’s hard to fathom the strength required to send some of these problems and seeing it in real life was awesome. This is Sean McColl hitting the big dyno on the first mens problem and yet again, the crown is just about to erupt. You can already see some hands raising. I hope you enjoyed the images and If you want see more check out the full Day 1, Day 2, and Day 3 galleries.